In the past, when you say burlap, you immediately think of a boring brown sack that’s usually used to hold potatoes or grains. However, it isn’t the case nowadays because burlap has come a long way from being an overlooked woven fabric to being one of the most-sought-after home decor materials. Burlap fabric is usually made from the fibers of the jute plant and mixed with fibers from vegetables to make it stronger. Its natural brown color is organic, so it’s safe for the environment and animals. It is inexpensive and accessible, and while brown is the most popular color burlap comes in, there are now a variety of colors available for DIYers in craft stores. If you’re looking to find ways to reuse your burlap fiber or want to do easy DIY projects, then read below. Have an outdoor event coming up and want to make it more special? Burlap works best if you have a themed party that centers on rusticity or something similar. All you need to do is to get some candle jars or recycled jam jars and then cut a rectangle of burlap fabric that is enough to cover the circumference of the jar. To secure it, you can tie it with twine and some decorative baubles. You can also reinforce it with a glue gun. Even if you’re reading this in the middle of the year, it’s never too early to start on DIY Christmas projects especially if it’s your favorite holiday. Christmas stockings made of burlap are a great alternative to the red and white that are usually put up for decorations during the yuletide season. You can have one or several of these on your mantel, your porch, or where you deem it appropriate and applicable. Making a burlap Christmas stocking is as straightforward as it gets. All you need to do is to cut out shapes of a stocking on burlap then sew or glue them together. You can add lace or extra ruffles at the opening to make it more decorative and a little loop too so you can hang it up. You can use the ordinary brown burlap or red if you have some. Table runners add elegance to the dining room or any table. It is usually a narrow length of cloth placed on top of a tablecloth or sometimes on a bare table. Table runners set the tone of the table as a decoration and define the seating arrangement, but they can also be used to blend with the party theme. They’re usually more decorative than a placement too. Using burlap to make a table runner is one of the easiest DIY projects you can do. You can choose to make it with no sewing by using glue or paired with another decorative fabric like lace. If you style it so that it hangs from the sides of a table, you can add a decorative ribbon at both ends as well. No gift wrappers on hand? Use burlap instead. You can choose to completely wrap the present in burlap or have it as a decorative accent instead. For the latter, it helps if the gift is already in a plain box. Using a plain box that contrasts with the color of the burlap you’re using will certainly help make it stand out. This is another useful decorative idea for a themed party, and the best part is you’re also recycling materials. Aside from burlap, you will be using toilet paper rolls as the base for the napkin rings. Cut it in the desired size, about half or a third, so you can make at least two napkin-ring base with every roll. Next is to artfully cover it with burlap and then tie the whole thing together by adding a decorative accent like a button or other embellishments. You can use burlap as a backing of a photo or of any photo frame. If using a frame, all you have to do is to cut an appropriate piece of burlap enough to fit it. If for photos, cut the burlap slightly bigger than the picture to make it contrast. 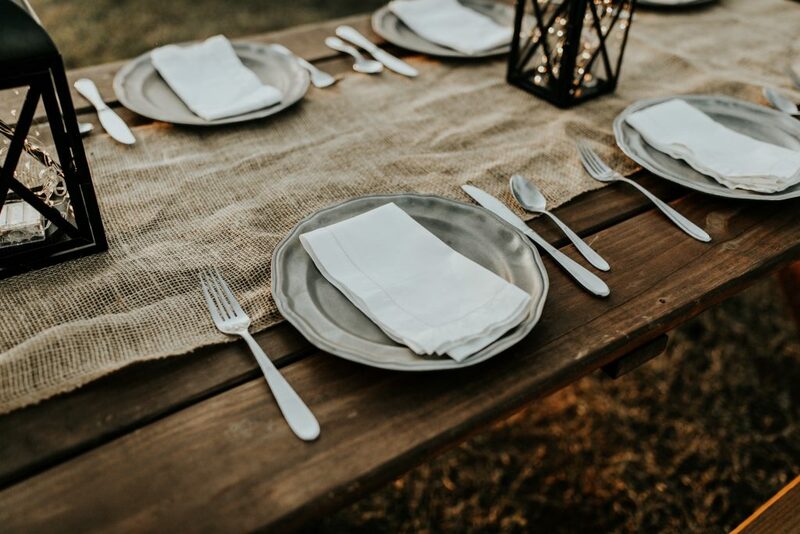 If you have a picnic or any outdoor party, you can use burlap to individually package your utensils. You don’t have to buy utensil holders when you can make your own. As an added tip, make sure to use biodegradable utensils as well. They can be thrown after use, but they won’t hurt the environment and you don’t have to do any kind of cleaning afterward. For this project, make sure you are using heavy-duty burlap to make sure that you can carry things inside your drawstring backpack. You can use recycled burlap from coffee sacks for this, and if it already has a design of its own, you can leave it as is. If not, you can add decorations too. There are many online tutorials on how to make your own drawstring backpack. Instead of using plastic or hundreds of sheets of paper to serve as a container for your party goodies, recycle by using burlap instead. These loot bags are incredibly easy to make, and they can be used for wedding favors and for any other party. Iron the burlap to make sure that it is wrinkle-free and easy to work with. You may need other things like lace or bias tape, some ribbon or twine to seal it, and glue gun or sewing machine. Come up with one design if you have a big party, or customize each bag if you only have a few people at your event. You can decide how small or big your burlap loot bag will be. Coasters are important for not spilling liquids onto wooden surfaces. Sometimes, they also help stylize outdoor parties. The best part of this DIY project is that it is easy to make, and with burlap, it is even more so. You can choose to cover existing coasters with burlap or make it from scratch in shapes you desire. Feel free to add decorations, paint, and other embellishments to fit the theme of the party or for your own use. There are so many ways that burlap can be used as decoration, and the projects mentioned above are just grazing the surface. Do you have decoration ideas that use burlap? Share your favorite ways to use it in the comments below.